The popular Ray-Ban Justin RB 4165 Sunglasses have recently been reintroduced for the second time. 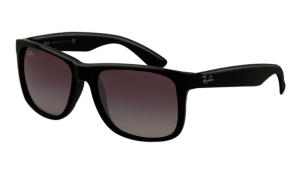 This extremely popular Ray-Ban sunglass is based on the Wayfarer style, but with a modern theme. The Justin has a rubber finish on the surface of each design, giving them a matte look, and with coloured lenses, a style of their own. The Ray-Ban Justin 4165s are supplied with a new look Ray-Ban case to protect the 100% UV lenses and are in stock and ready to ship today. Head over to the Ray-Ban Justin RB 4165 Sunglasses product page now to choose your perfect style. Following the success of their Plaintiff Aviator style sunglasses, Oakley have released the new Plaintiff Squared sunglasses, reminiscent of styles from the 50’s but with a C-5 alloy frame that makes them extremely lightweight and very comfortable to wear. The detailing on the Plaintiff Squared Sunglasses gives it a unique look, achieved by a shallow channel along the length of the earstems filled with a colour that compliments the frame. The new Oakley Plaintiff Squared sunglasses comes in a range of colours and styles, and polarised options are also available here at Sunglasses-Direct for very competitive prices.